The Exosuit Commander Pack includes 30 detailed Exosuit miniatures — 6 for each Path and a set of 6 Guardians. 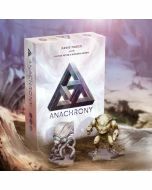 These miniatures can be used instead of the hex-shaped Exosuit markers to help you immerse yourself in the world of Anachrony. Each Exosuit has a designated Worker slot, where you may place your Worker as you send your Exosuit to take an Action on the Main board. The Guardian Exosuits are for the Guardians of the Council module and the Chronobot solo play variant, but optionally they can also be used as an alternative set of Exosuits for a Path.